UK, Ireland and Europe compatible. Phar Lap, the legendary Australian racing horse, is as well-known today for his mysterious death as for his fabulous accomplishments in life. Beginning at the end, the film flashes back to the day that Phar Lap, despite his lack of pedigree, is purchased on impulse by trainer Harry Telford. Phar Lap loses his first races, but Telford's faith in the animal is unshakable. Suddenly the horse becomes a winner, thanks to the love and diligence of stableboy Tommy Woodcock. American-promoter Dave Davis arranges for Phar Lap to be entered in several top races, where his "long shot" status results in heavy losses for the professional gamblers. 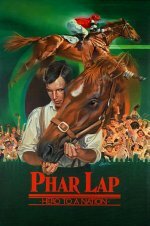 Just after winning an important race in Mexico, Phar Lap collapses and dies; though the film never comes out and says as much, it is assumed that the horse was "murdered" by the gambling interests.